I have fond memories of sitting at my grandmother's table, watching her sip her tea (a no nonsense teabag, made strong) with a sugar cube expertly clutched between her teeth. She was able to keep that cube in place sip after sip. I tried to imitate her, but I could never stop myself from biting through the sugar after one sip. In my mind, my grandmother's skill was an impressive act of restraint. She was always particular about which sugar cubes she liked to use. They couldn't be the tiny little mini cubes. She liked the larger, more rectangular sugars. They were more substantial for her large cup of tea. To my young mind, I didn't understand why there was a difference. Of course, more sugar would be better, but why would the shape matter? I never realized that the look and feel of the sugar was just as important as the taste. 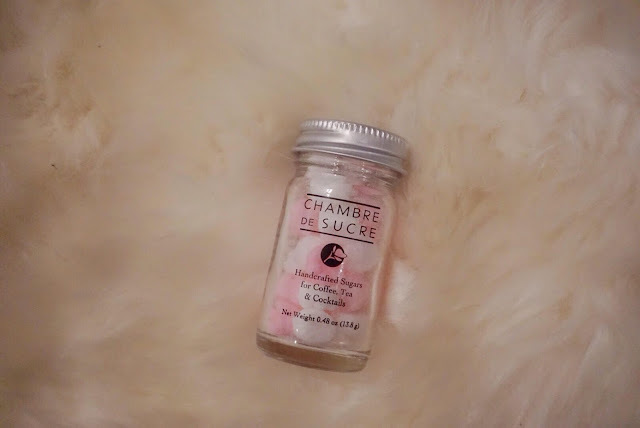 I've recently been introduced to photos of gorgeous artisanal sugars from Chambre de Sucre on Instagram. I've drooled over these beautiful little works of art that stir my feminine side. There are sugars to suit every style and mood. Little petite hearts and flowers, or more substantial beautifully decorated cubes that my grandmother would have adored. And those cup huggers! I end up making high-pitched happy sounds every time I see them. Browsing through the website makes me feel like a little girl in an enormous toy shop. I want just about everything. I was lucky enough to receive some of these sugars of my very own, and they are even more beautiful in person. They just beg to be placed on an antique porcelain teacup. One that isn't too ornate, so the sugar can be properly admired and enjoyed. I have to admit I was reluctant to try them because they look so perfect! I didn't want to waste even one. But they are sugar, made to be dissolved in tea or on the palate. I forced myself to try one of the little flower sugars. It's going to sound overly-dramatic, but it was just the perfect little drop of sweetness. You may scoff, but for me it is true. The sugars on the website come in all different forms and package sizes, and the founder Lisa has created smaller packages designed for gift-giving. Perfect for the holidays, or just to show someone that they are in your thoughts. Lisa has found the perfect way to create a delicate sensory experience to accompany tea (or coffee if you must). I REALLY dug those sugar stirrers.